When it comes to interactive data visualizations, I am a junky. I don’t mean the dime-a-dozen country maps showing the favorite baby name/band/movie/current fad for each state. I mean the kind that present information in a way that surprises me, even when I am relatively familiar with the data. The Demographics Research Group has created some really illuminating data visualizations highlighting residential segregation by race, educational division in Washington, D.C., and this older one on electoral changes in Virginia. 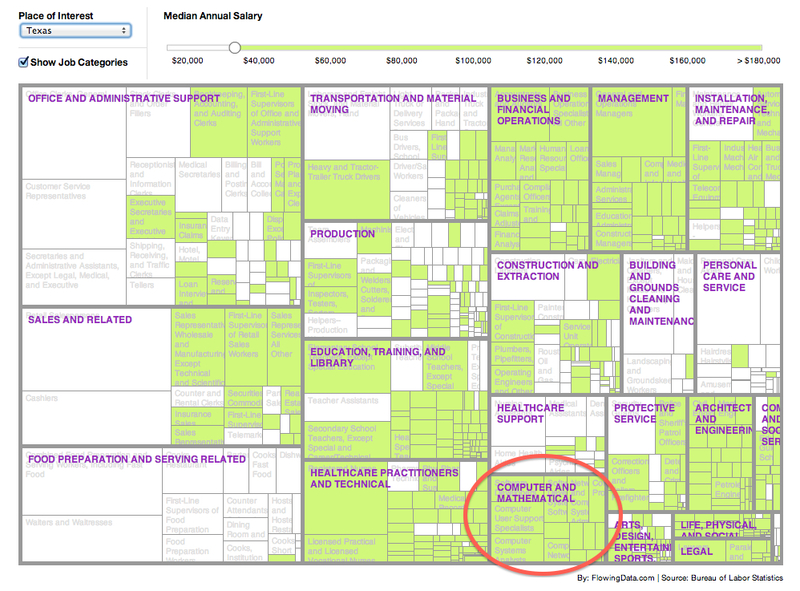 Today I spent quite a bit of time exploring this interactive chart of Jobs by State and Salary, created by Dr. Nathan Yau over at FlowingData. In this chart, Yau shows the number of people employed and the median income for all jobs in a state. 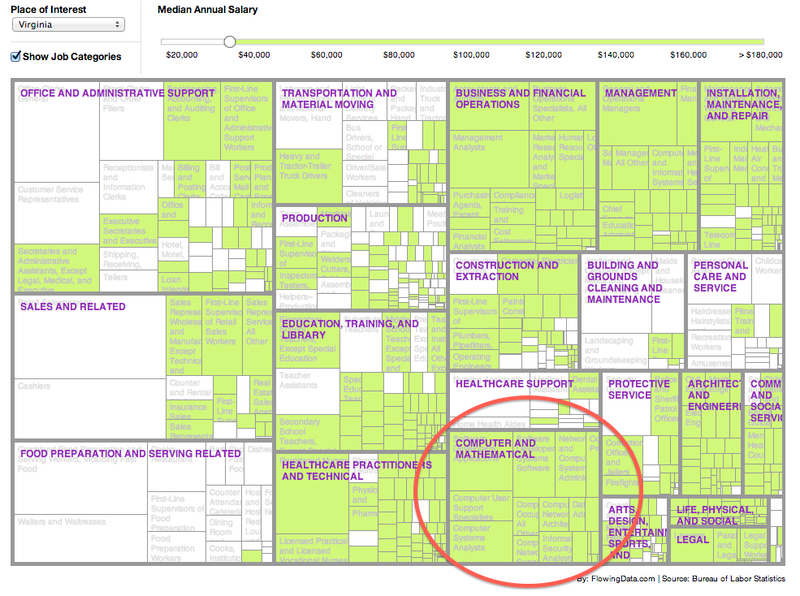 The top image shows the occupations in Virginia with a median annual salary of roughly $33,000 or more highlighted in green. There are two things that I like about this visualization. First, it allows us to see the relative size of various occupations in Virginia’s economy (or state of your choice) along with the median income for each. In the image below, I’ve set the income slider to an annual income of $21,000/year or less (the occupations in white; occupations in green earn more than $21,000). This quickly allows us to see how much of Virginia’s employees earn these low wages. 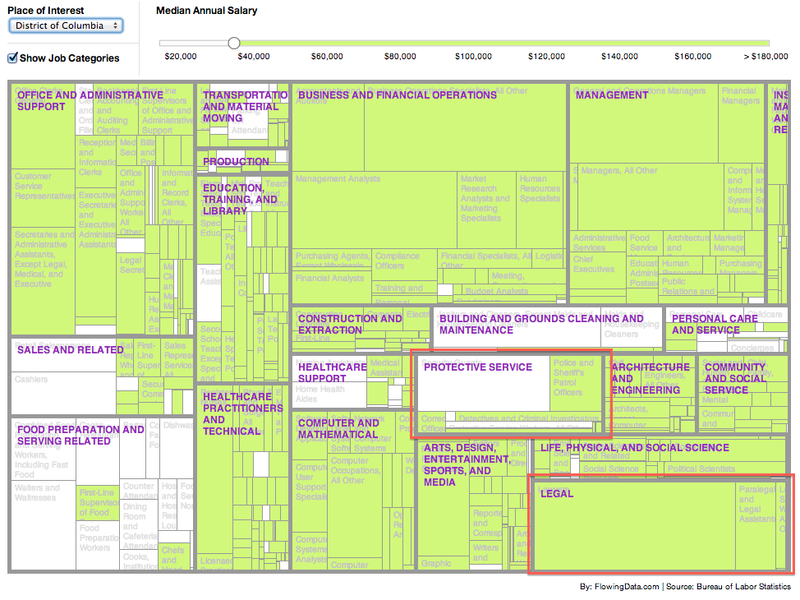 But it also lets us compare the various types of low-paying jobs. For example, Janitors and Custodians, highlighted in yellow, make up a larger proportion of the Virginia workforce than Childcare Workers but are less prevalent than Cashiers (red arrows). Second, it allows us to compare states. Consider the difference of the relative size of the Computer and Mathematical occupations in Virginia and Texas (below). Texas actually has more employees in these types of jobs but they represent a smaller proportion of the workforce than in Virginia. In Texas, 13.4 percent of their workers are in High-Technology jobs (this has been updated to 2018 data), which include Computer and Mathematical occupations, vs. 17.7 percent in Virginia. Virginia: Texas: And just for fun, consider the contrast to the workforce of the District of Columbia. It is clear that this is an industry town: Remember that the size of the boxes shows the relative size of the occupation in the larger workforce of D.C. Thus, despite the size of the boxes, Virginia has more than twice as many Protective Service employees as D.C. However when it comes to Legal workers, there are more in D.C. than are employed in all of Virginia, including almost twice as many lawyers. I would encourage you to head over to FlowingData and do some comparisons of your own. I hope you find something that surprises you.